It comes as the UN Security Council discusses imposing fresh sanctions against North Korea after it conducted a fourth nuclear test on 6 January. Pyongyang said it had successfully tested a hydrogen bomb, but nuclear experts have questioned the claim, saying the blast was not large enough. On Thursday morning, Japan's Kyodo news agency reported that Japanese officials were concerned by recent activity at the Sohae Satellite Launching Station, also known as Tongchang-ri. 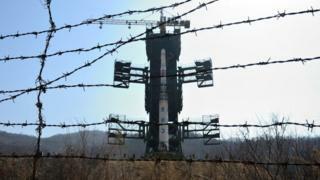 Analysis of satellite imagery suggested preparations were under way for a missile or rocket launch, possibly within a week, the officials said. South Korea's Yonhap news agency meanwhile cited a government source as saying screens had been set up at key areas at the site, probably to deter satellite surveillance. Later, an unnamed US official in Washington told AFP: "The indications are that they are preparing for some kind of launch. "Could be for a satellite or a space vehicle - there are a lot of guesses. "North Korea does this periodically - they move things back and forth... There's nothing to indicate it's ballistic-missile related." Last year, a taller launch tower was erected at the site, in what experts said might be preparation for firing a long-range rocket. The North last conducted a long-range rocket launch in December 2012, successfully putting into orbit an object Pyongyang claimed was a communications satellite with the three-stage Unha-3 carrier. The US and its allies viewed the launch as a disguised test of ballistic missile technology. The UN Security Council subsequently found that it was "a clear violation" of resolutions banning such tests and imposed new sanctions. North Korea has said its space programme is peaceful, but it is believed to be developing an intercontinental ballistic missile (ICBM) that could strike the US. It is also working to make nuclear warheads small enough to fit on a missile.